Tim's appear to have gone for the 'all things for everyone' approach to packaging design. They have maintained their traditional red and white stripes, they have also included their similarly traditional mountain graphic. There is also a modern image showing a Life Belt - presumably to help save your from drowning in Vinegar! Overall, the effect seems to mix modern with classic along with mundane fonts not very well. We do however like the flavor color coding. These relatively thickly cut Chips did not have a crispy snappy crunch as is often the case with regular Chips, but it didn't have a hardened oil soaked Kettle Chip texture. They actually provided a perfect crunch to noise ration, aligned with a munchable snack that did not turn to mush instantly. These Chips were cut thickly and cooked well. There were curly and irregular shaped Chips and there were some skin edges. The Chips were a fairly light golden yellow in color. There was some browning but not much. The seasoning created a rough sort of texture but no particular colors were noticeable. A Nose Plunge Test revealed a slight vinegar aroma. Add that to the copious amounts of salt in this bag and we were sure to be in for a well balanced Chip, no? 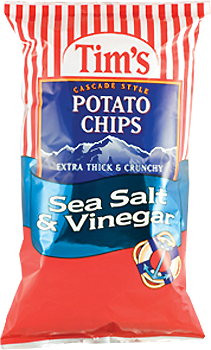 The secret of Salt & Vinegar is to combine the flavor so neither Salt nor Vinegar dominates. Originally from the UK, the flavor was invented in the 1950s to mimic the seasoning the Brits put on their Fish 'n Chips (Fries). These were fairly well balanced, but the Vinegar still dominated just a bit more than it maybe should have.